As a part of our “Inside UMB” series, we’ll be sharing stories about our people, culture and all the things, big and small, that make us who we are. This story focuses on “Associate Spirit.” One of UMB’s key shared values, we rely heavily on our people and their collective attitude and skills to differentiate us as a company. The following is a Q&A session with Director of Talent Acquisition Mary Beth Majors that gives an inside look at how UMB diversity practices are helping us hire top talent. When did you first meet Jennifer? I met Jennifer Hertha over the phone in 2007 when recruiting her for a teller position with UMB. Impressed by Jennifer’s phone interview, I invited her to interview in person. When she arrived, I noticed that due to her being in a wheelchair, she had some form of disability. Admittedly, I was hesitant at first because I wanted to ensure she was treated like any other candidate, but was also afraid of saying the wrong thing. 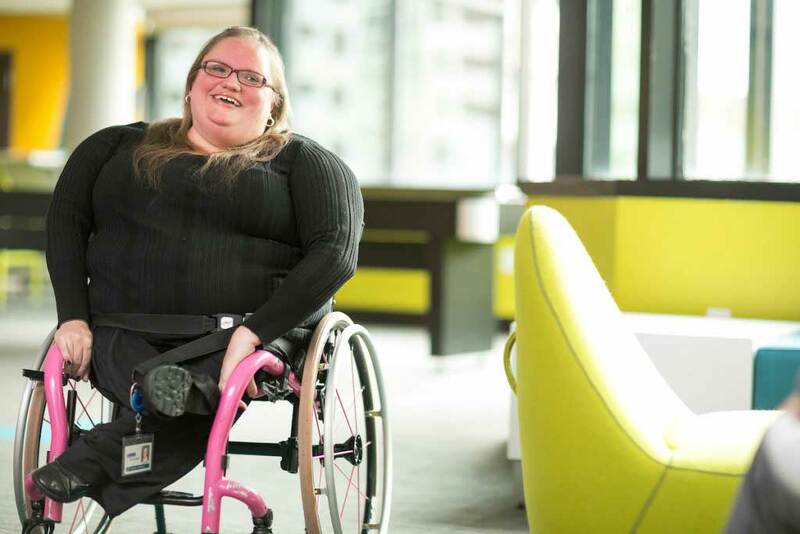 However, what struck me most about Jennifer was that she was determined and didn’t let her disability impact her confidence in fulfilling her responsibilities. Jennifer interviewed wonderfully and was hired for the position. How has Jennifer contributed to the organization? Jennifer didn’t waste any time in showing us what she was capable of. She consistently impressed her managers, received multiple promotions, and is now one of my top performers on the Talent Acquisition team. How has she uniquely added to the team? Working with Jennifer has been such a good thing for me personally. While UMB has always had a focus on having diverse workforce, she has challenged me to take an even closer look at our hiring practices. Now, Jennifer and I advocate together for people with disabilities in the community and work to help other companies evaluate their own hiring efforts‡. How does UMB view diversity? At UMB, diversity is examined not just through gender, race, ethnicity, etc., but also through the breadth of experiences, ideas and beliefs that our associates bring to the table. Diversity and inclusion is not merely a statement on a website; it means that all are encouraged to contribute fresh ideas and to embrace differences. When each of our associates feels like a valued member of UMB, we are doing our job. Our philosophy is to hire great—and different—talent and to give people the tools to succeed and utilize their strengths. Recently, we shared some of these efforts with the Kansas City Star, including being at the forefront of supporting a new job board to match candidates with disabilities with employers‡. Learn more about community involvement at UMB and the benefits available to associates. In addition, search #UMBheart on social media to see photos of other associates making a difference in their communities. Like what you see? Check out current career opportunities or become a UMB Insider to see more stories about associates, company news and more.